Bravo Sirajul Islam – that’s a rather more definite statement than the one from the Lib Dems. However I don’t get the ‘guarantee’ bit; are you saying that IF Biggs gets the post of Mayor he is not guaranteeing to carry on with the funding announced by Rahman, or that Labour have the ability to stop the funding at this point in time? You’re not joking, are you. I’ve just checked online and the application really is until 7pm only. Some people are divisive, but this lot are divisive by accusing everyone else of being divisive. And they’re getting £25k of taxpayers’ money to help peddle their views. What’s your view on that, Dan? 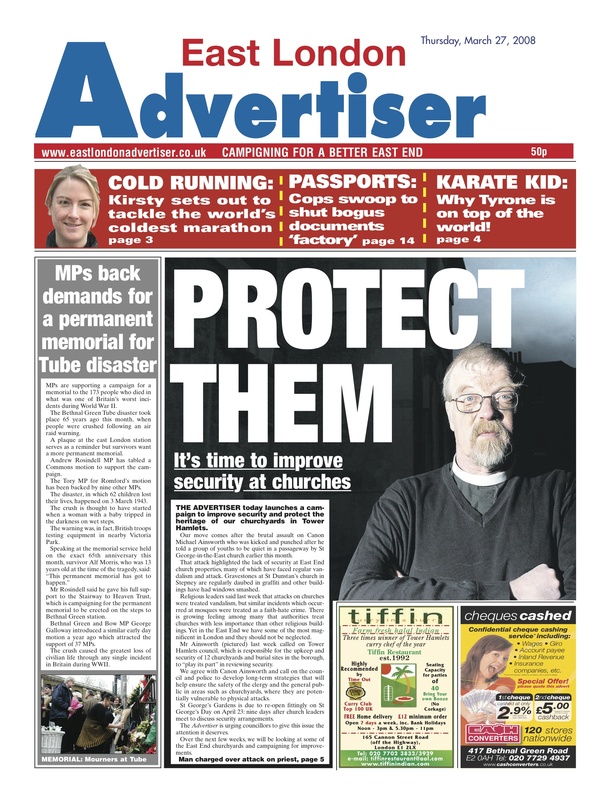 Well I don’t think they’re getting £25k “to help peddle their views”, are they? However, I do think they are intolerant, and this does raise a serious question about their character, which in turn should affect their access to community money. What kind of society do they chose to inhabit by living here? Would they feel more comfortable in Saudi Arabia? As Bangladeshi immigrants they would be treated like scum, yet that is the type of society and culture that they apparently advocate. Tolerance is a two way street and it’s the role of our political leaders to explain that to all sections of the community. 1. TO ADVANCE THE RELIGION OF ISLAM. 2. TO ADVANCE THE EDUCATION OF THE PUBLIC IN THE ISLAMIC CULTURE AND RELIGION. In other words, to peddle their views. Now, now, a deli serving wine could attract gang activities. Let’s not…Oh, hang on, this place is in Shoreditch, not Campania. It is fascinating how these people use the language of multiculturalism to promote their own agenda. One can see good-natured councillors nodding and rubbing their chins over rhetoric about “communal tensions” and “racial disharmony”. The local garage opposite me fuels lots of things. Maybe I should object to them ;). I must make it my business to visit and patronise Burro e Salvia. I hope as many local residents as possible do the same. The Deobandi sect are the same people trying to build a 40,000 seater Mosque by the River Lea near Bromley-by-Bow. We really don’t want these bigots anywhere near our Borough. What right has a mosque got to dictate what happens on the street it’s on? I thought this was supposed to be “tolerance” and “diversity” but it increasingly seems like the only people being tolerant is we infidels. I urge people to spoil their ballots come the mayoral election. I despair. Are these Cllrs just plain stupid or are they creating poorly constructed strawmen? Why are they citing the ‘good works’ local religious organisations do? The funding isn’t to support good works it’s to renovate and refurbish. I find the response from John and Siraj amazing when they released a press statement today entitled ‘Biggs slams Mayor car waste’. So they’ll attack the Mayor for his car usage but not spending nearly two million on faith organisations? Why? Because they don’t want to say no to these groups a year before the election. I bet if it was a chicken and chips shop it would be immediately granted a 24 hour licence! its ok we will have muslim gangs stopping people from going there,the area has had it now…. Unfortunately this Mayor has a very narrow view of the needs of the community at large – divisive, weak, egotistical and vain – a petty functionary without function who bigs himself up at every opportunity. Well, pride comes before a fall Lufter – you had your chance and you blew it! A little digging shows that Shoreditch Masjid Trust is a registered charity numbered 1106236 in its full name of Shoreditch Masjid Trust and Islamic Cultural Education Centre. 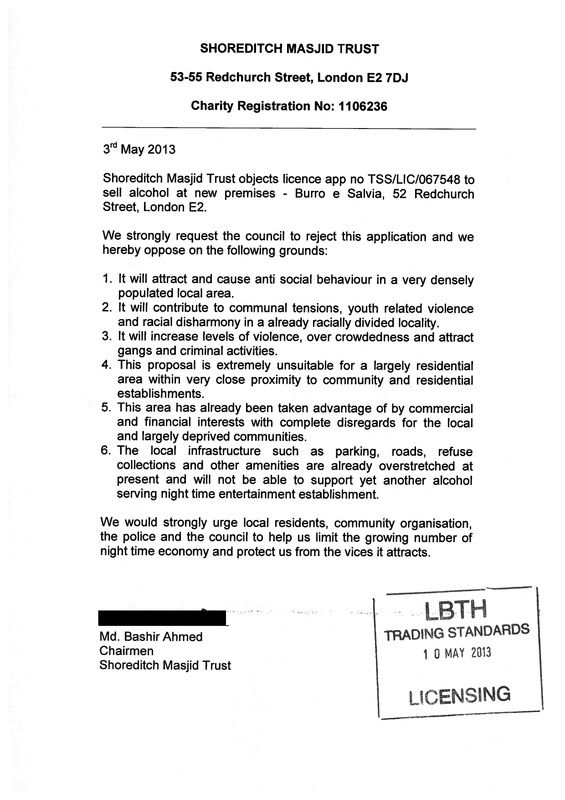 One of the Trustees is former LBTH Councillor Abdul Matin who was himself seriously assaulted at the junction of Vallance Road and Derbyshire Street in April 2009. Mr Miah knows not of what he writes. Burro E Salvia has applied to sell a limited range of wines up to 7pm on all days except Sunday when they close at 5pm. A petition of 72 residents who objected to the granting of a licence was also submitted. 9 addresses were outside Tower Hamlets, 7 were unidentifiable and it includes signatures of the trustees who had already objected. Here we have a now publically (tax payer) funded religious organisation stating that this area of Tower Hamlets is “racially divided”. I genuinely fear for the future of tower hamlets within the current narrow politics of LR/IFE/Respect. We are divided and the “one community – one religion” politics of LR is causing community tensions. I repeat – It is wrong that my hard earned taxes are being pumped into religious organisations. This is an example of the dangerous rhetoric of fear being used to impose a religious ideology of the minority of this community upon the majority.